I know, I know, I am being one of “those” people that is posting Christmas ideas before Thanksgiving! I am right there with you on the craziness of rushing the holidays. For reference, my home is still fall-ified, I am waiting a little bit longer before I turn it into a winter wonderland. 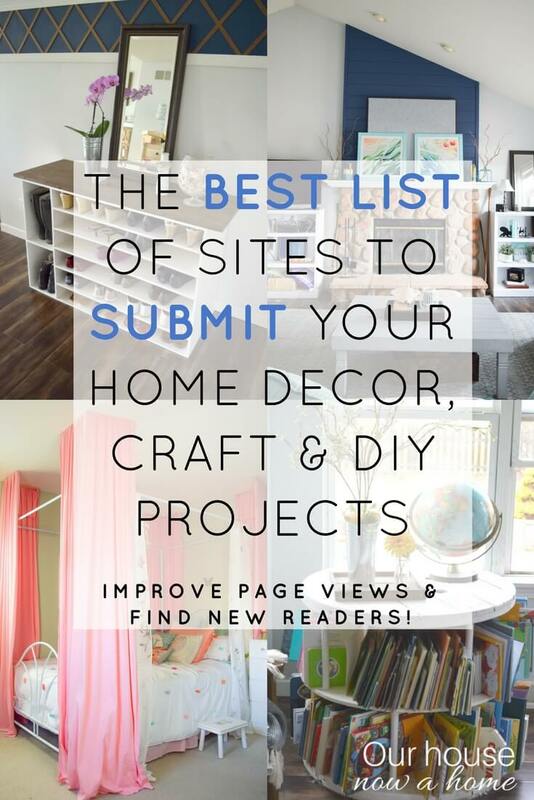 But, this blog is for me to share my home, but also share some ideas for others to decorate their home. I need to get out the ideas early enough for others to see and create. So, see…. there is a method to my madness. Today I am sharing DIY Christmas tree topiary – simple and low cost, which is perfect for the season. We all need to watch our spending this time of year, those presents won;t buy themselves. But, having a beautifully decorated home to deck the halls is a big priority too. 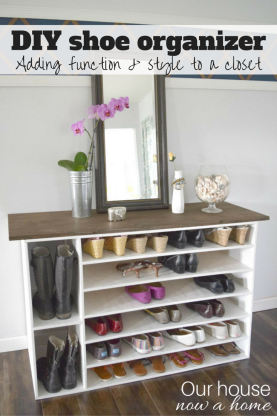 This project is sooo low cost and only takes about 5 minutes to create! I actually was able to get the two tomato cages on discount because it is the off season. Yay for clearance! I did not connect any of the garland to the cage, just wrapping a branch here or there around the wires of the tomato cage. Starting from the bottom and working my way up. The garland I got I had to pull the individual branches our, having them become bulkier as I pulled them apart. Which worked out great because it filed in any holes of the wrapping. I ended up using two 6 ft garlands for one tomato cage. I warned you this was a 5 minute craft, don’t believe me? Set a timer, in fact I might have exaggerated, this would take less than 5 minutes. I got some sparkly pine cone ornaments from a craft store and set them on the newly created Christmas tree. 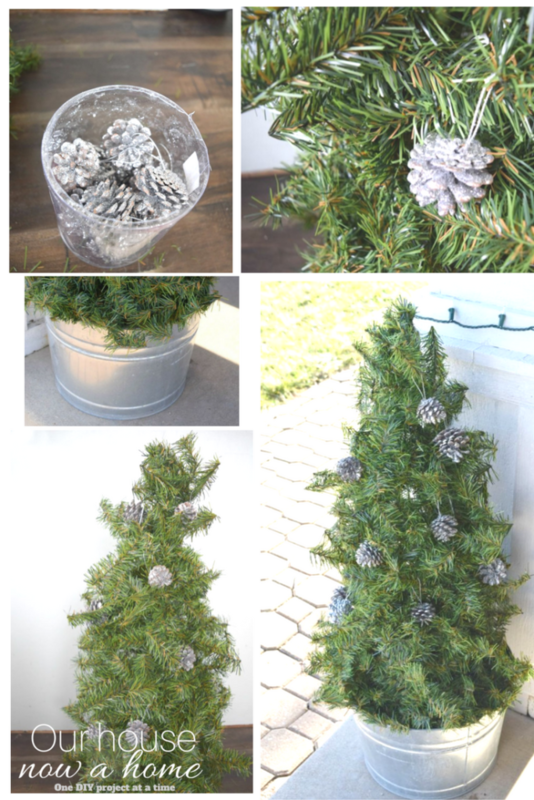 These DIY Christmas tree topiary – simple and low cost are done! I created them last year and had them for my Christmas decor. I had so many projects last year that I never got around to sharing them here. I will be pulling these beauties out again when I start decorating my home this year for Christmas! They are still in great shape. 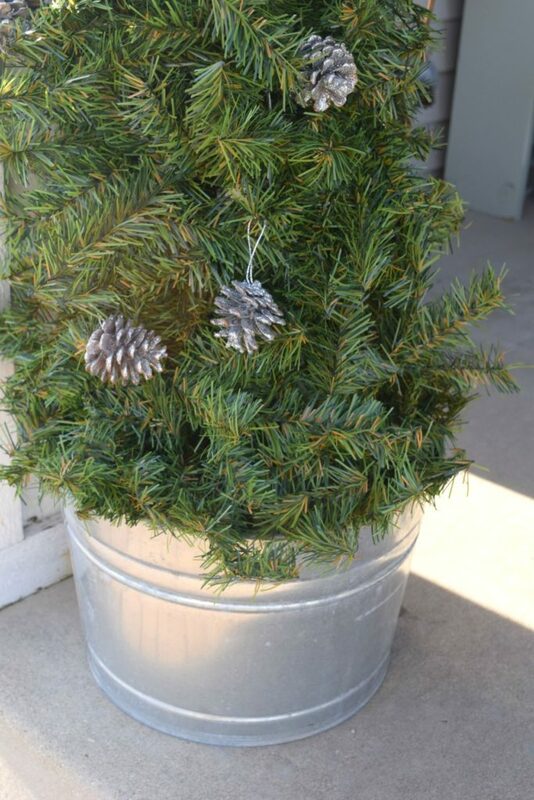 I did put a large brick in the bottom of the metal container before putting the tree frame inside, just so that the wind could not knock them over. I had no issues with it ever blowing over. I was working a ton this past weekend on Christmas crafts, I always like to add a few to my decor each year. 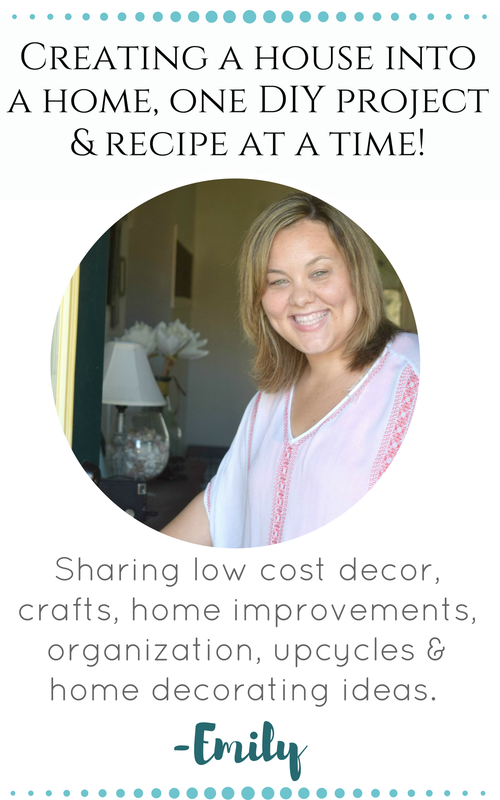 As I gain confidence in my decorating skills and my crafting skills my style has transitions. I am willing to try new things, which means some of the older items do not work anymore. Which means I need to make even more decor items! 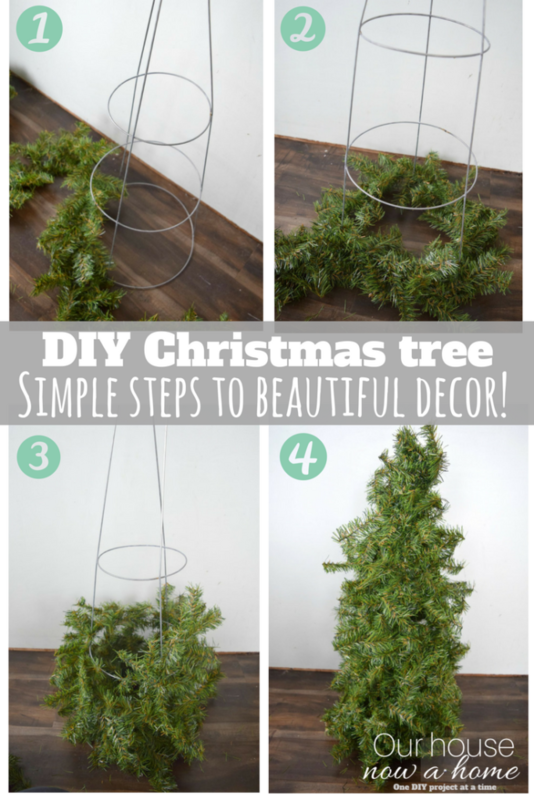 I love these DIY Christmas tree topiary – simple and low cost they are honestly so quick to create. Don’t even get me started on how expensive store bought topiary’s this size would be, probably close to $100 a piece! Total I spent $30! Yep, this is a much better option. I am currently making my Christmas present list out, which is wayyyyy different from when I was a kid. Back then I wrote down what I wanted. Now I make a list on what I will be getting other people. Then I have to go shop for it and spend my money on it. Very different from the childhood Christmas list. With my home decorating obsession still strong, I try to cut corners when I can on costs. Diminish the guilt of me decorating for every season. I mix store bought with DIY and end up with a winter wonderland of a home that is ready for Santa and all of the magic of the season! 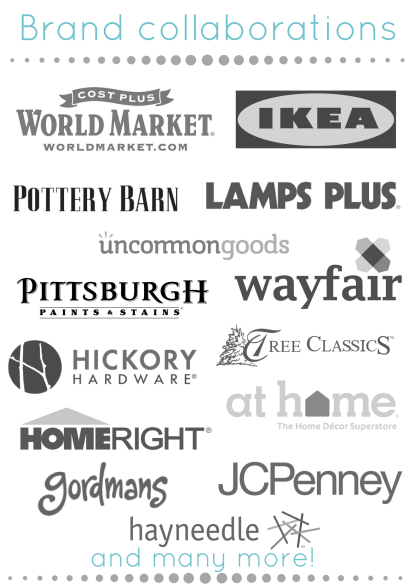 Have you started shopping for Christmas yet? What a fantastic idea! It’s so simple but so pretty and so unique! 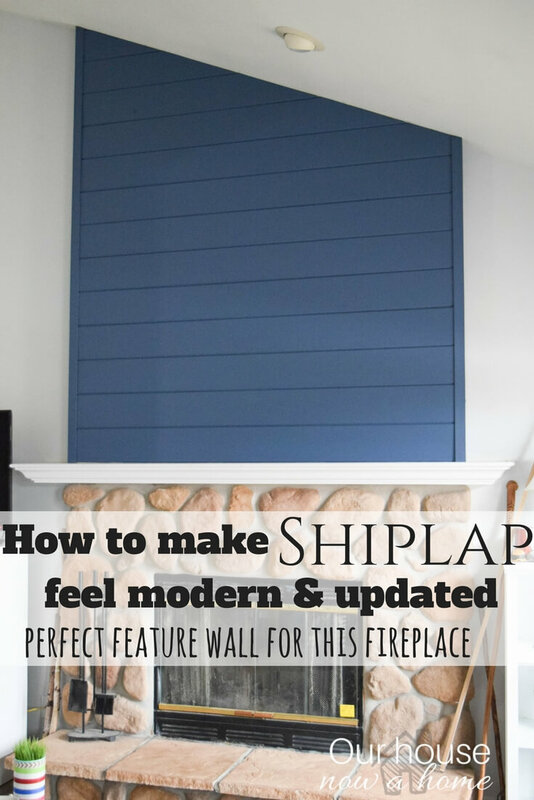 This is such a great idea – I love how it turned out! That is an adorable idea and seems easy to make too. I love that you could customize it to fit whatever your decor theme is. Now that’s a DIY project even I Can do. I need to make me two of these for my door step. Super cute idea! I love that it can be changed for different seasons/uses. What a great project. I love that you used a few things that I have around the house like the tomato cage. I also love that it is frugal and easy. I can see making one or two of these for my home. I am thinking one of them would be good with seed ornaments for the birds. I love this idea, and the metal buckets are just perfect with the “trees.” Pinned. Love these! I need to make some for our front porch area. What a great idea! These things are a fortune in the store I would have never thought to make my own. Omg this looks simple enough!!! I love crafts that are simple to assemble yet look like they took hours of work!!! 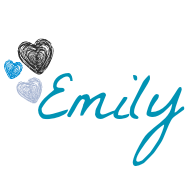 This is so cute and you are right, SO EASY! I love that you can add whatever little decorations you’d like to it! They look so expensive and I would never have thought them to be this easy to make! 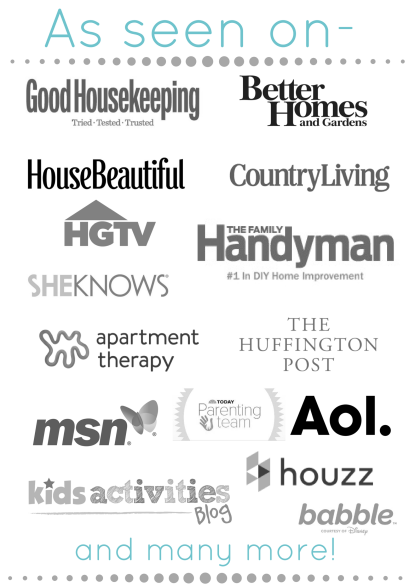 A DIY worth investing it because you can decorate ad use through out the year! 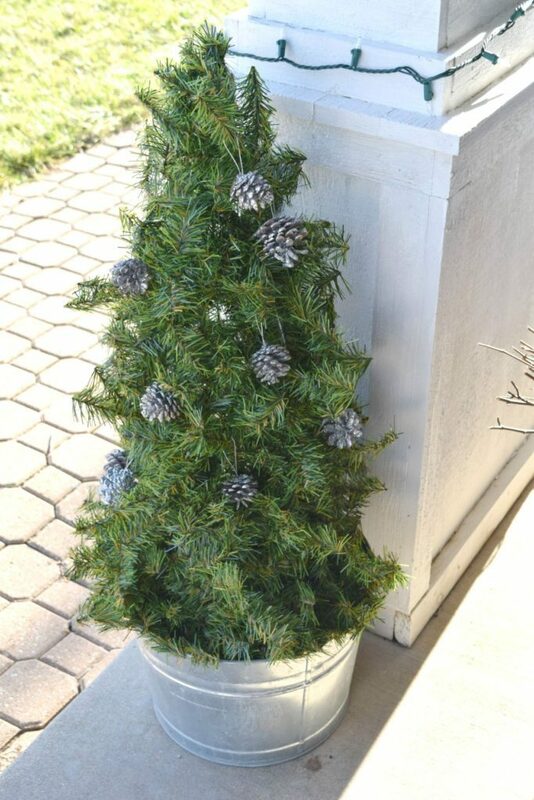 I love the look of this homemade faux tree! Very rustic chic and perfect for our entry way. How cute! Love how simple it is. Great idea! I like the simplicity of this design. It also has a great appearance. How cute and budget friendly! 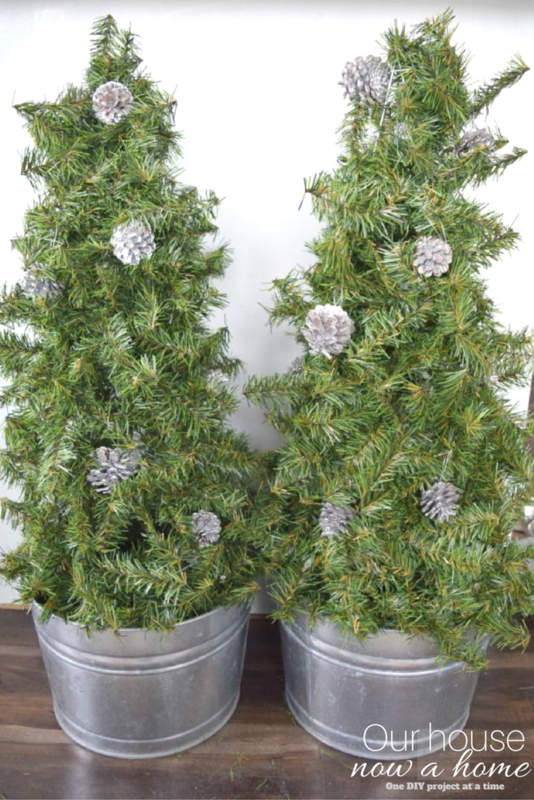 We have a few store bought trees for the entry way and they were expensive! 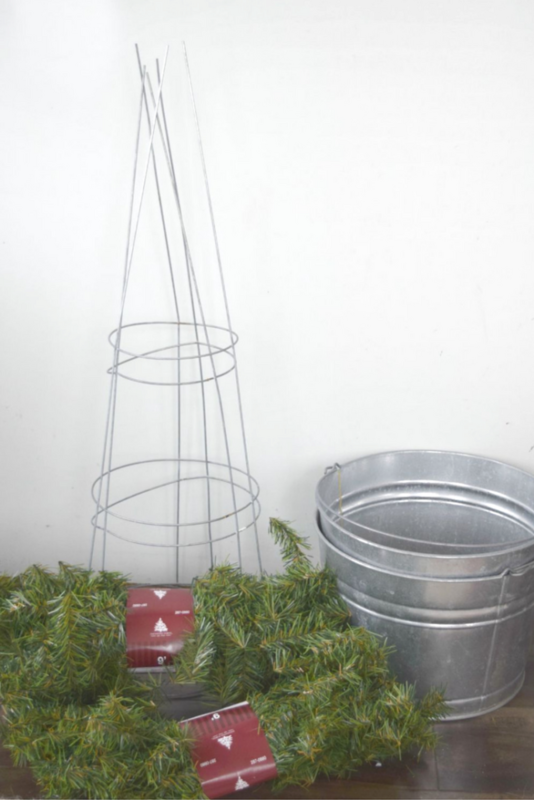 Love the simple galvanized bucket you used as well. It was a simple but nice touch. great idea using those tomato cages! 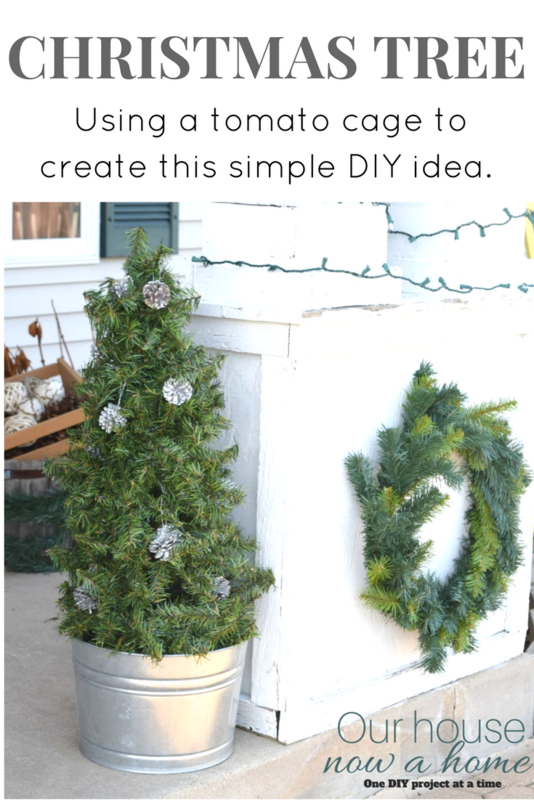 Very cute idea, I love the metal pot you put it in too! OMG! I never would have thought! I am totally doing this outside. Thanks for the idea. SOO cute!! 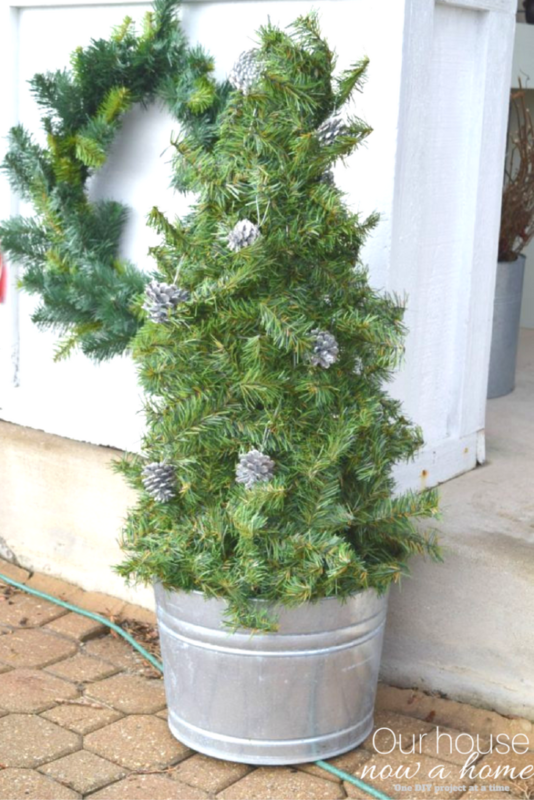 The metal pot as the tree base is genius! So cute! What a fun project. I tried this from someone else’s picture. Not happy with it. I will take it apart and do yours. Thank you for sharing. Mine from 15 years ago from CVS Pharmacy bit the dust last year. I love homemade things better.